That's pretty much the ultimatum Scotland's top Catholic cleric gave to lawmakers who support a decades-old law that made abortions legal. Church members were instructed by Cardinal Keith O'Brien on Thursday to boycott politicians who did not condemn the "unspeakable crime" of abortion. Politicians who support the abortion law should not receive Holy Communion or remain full members of the church, O'Brien said during a sermon in Edinburgh to mark the 40th anniversary of the Abortion Act. Abortion was legalized in England, Wales and Scotland in 1967. Pope Benedict XVI has said it is up to individual bishops to decide whether Catholic politicians should receive Communion if they support abortion rights. Could the highly esteemed pages of The Wall Street Journal soon be controlled by the media mogul who operates the Fox News Channel, MySpace.com and Twentieth Century Fox? In a reversal, the Bancroft family that holds a controlling interest in Journal publisher Dow Jones & Co. said late today that they would entertain the $5 billion bid from Rupert Murdoch to buy the company, as well as other potential offers. Family members previously said they would block a Murdoch bid to buy the company. The union representing Journal employees and reporters in the paper's China bureau have expressed strong opposition to Murdoch's bid. 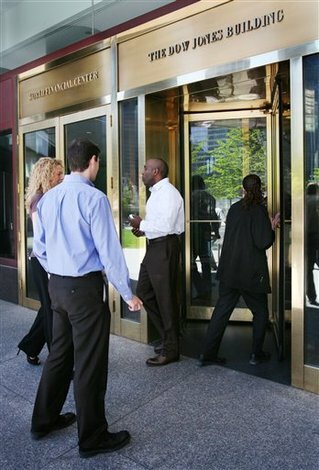 For the latest developments, read this AP story by business writer Seth Shutel. 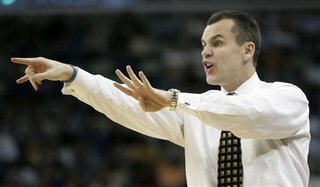 Florida coach Billy Donovan took his name out of the running for the Kentucky job in April, saying at the time that the University of Florida was the place for him. Apparently, it was only short-term. An NBA source has told AP that Donovan bolted Florida for the riches of the NBA, agreeing to a five-year deal on Thursday that will pay him $5.5 million annually to coach the Orlando Magic. Orlando has been searching for a coach since Brian Hill was fired after consecutive losing seasons. Donovan has been the subject of rumors since Florida won its second straight NCAA title in April, including at Kentucky, where he got his start as a coach, and with the NBA's Memphis Grizzlies. Orlando was a bit closer -- about 115 miles -- and the Magic are going to pay him more than twice his $1.7 million annual salary at Florida. The Gators were likely headed toward a rebuilding season after four of its starters left school for the NBA. Alcohol, cocaine, marijuana. It's a drugged out world we live in. In Rome, researchers have found there are traces of cocaine and cannabis in the Eternal City's air. For more on Rome's "high" air quality, read this AP report out of Italy. The weekend arrest of troubled actress Lindsay Lohan, 20, for investigation of driving under the influence does beg the question: Who served the under-age Hollywood star alcohol? In this AP report out of Los Angeles, reporter John Rogers looks at how the California Alcohol Beverage Control Board is starting to crack down on the Hollywood club scene. In Culpeper, Va., police arrested two people for public intoxication after they tried to avoid drinking and driving by heading home on horseback. Finally, customers in the southern Dutch city of Maastricht will have to offer up their fingerprints and have their ID's scanned at coffee shops that are licensed to sell marijuana. The measures are expected to help stores show they are not selling pot to underage customers and not selling more than the maximum permitted to a customer, such as the young man shown above, on any given day. For more, read this AP story from Amsterdam by reporter Toby Sterling. Could it be fresh footage of the supposed mythical creature living beneath Scotland's most mysterious lake? Loch Ness monster watchers sure hope so. Gordon Holmes, a 55-year-old a lab technician from Shipley, Yorkshire, took video Saturday of, "this jet black thing, about 45 feet long, moving fairly fast in the water." Marine biologist Adrian Shine, who viewed the video, called it, "the best footage I have seen." He hoped to properly analyze it in the coming months. Loch Ness is the largest inland body of water in Britain. It is about 750 feet to the bottom -- that's deeper than the North Sea. 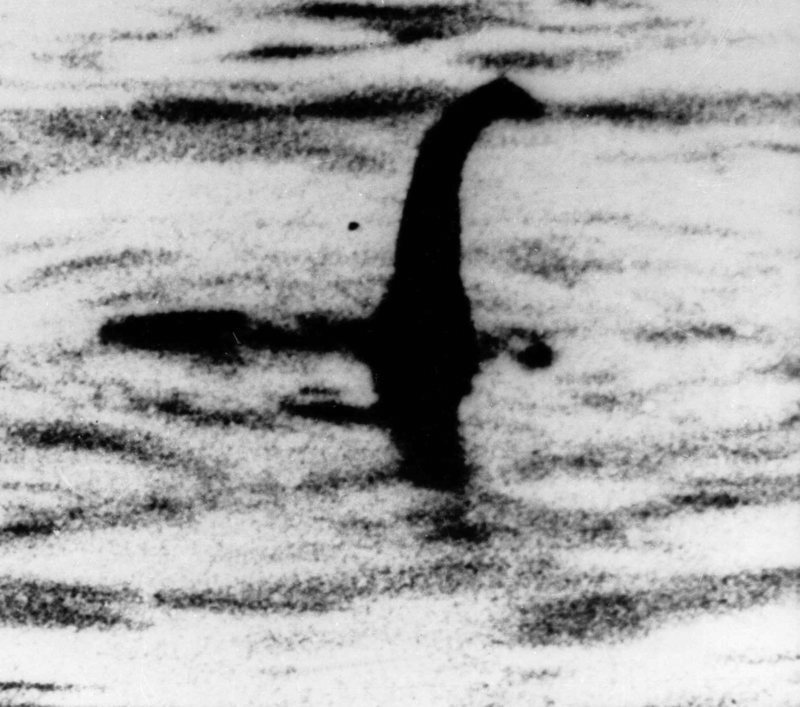 There have been more than 4,000 purported Nessie sightings since she was first caught on camera by a surgeon on vacation in the 1930s. Check out this AP story for more on the legend of Loch Ness. Nearly three months ago a tornado tore through Enterprise High School, killing eight students. This evening the senior class graduates -- with two empty folding chairs reserved for classmates who died in the storm. More on preparations for the ceremony and reactions from graduates in this AP video. In a public service announcement two years ago, Lindsay Lohan can be heard laughing after a member of A Simple Plan warns against drunken driving. Hear it in this AP audio clip from TMZ.com. Each day, AP Photos deputy director Michael Feldman, highlights some of the strongest pictures of the day at the AP global news meeting. Below are a few of the images that caught his eye on Thursday. 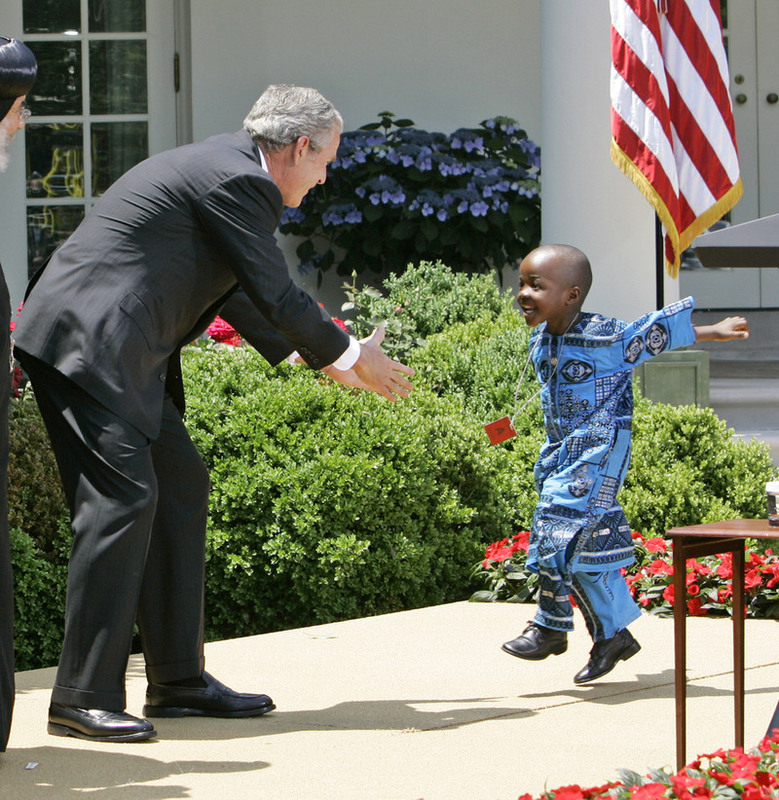 Feldman said this picture stood out from several taken at a White House event because it captures the child in mid-jump. In the image, President Bush reaches out to the four-year-old son of an HIV activist from South Africa. 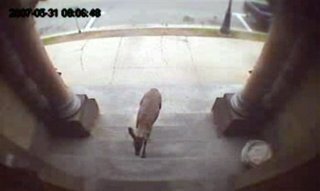 DEER: A deer marched itself right into the New Brunswick legislature today. (Mad about some recent hunting bill?) Whatever it was thinking, the darned thing jumped onto a desk, smashed a keyboard, raced through the offices and bounded out a window, leaving shattered glass strewn outside. Whew! PANDAS: Less than a year after being released into the wild, poor 5-year-old Xiang Xiang died. RHINOS: Sadly, all the news today seems to be bad. A super rare northern white rhino also died, possibly of old age. There might only be 13 left worldwide. ENDANGERED WILDLIFE: If you tell people not to do something, they might do it more. That revalation from the journal Nature. Could be controversial. HOGS: Good catch, kid. But how on earth did "Monster Pig" get there in the first place? Five years of wanting to be a champion speller ended today for Samir Patel. The 13-year-old Texas favorite to win this year's Scripps National Spelling Bee spelled the word clevis (it refers to a type fastening device) "c-l-e-v-i-c-e."
He wiped away a tear as he talked about his loss. "The first thing I thought was c-l-e-v-i-s, and if I had been slow and cautious like I always am, I would have got it right," he said. "But I just outsmarted myself. It was an easy word. I just made a stupid mistake." Things went better for Andrew Lay (in this picture by AP photographer Lawrence Jackson) who was obviously surprised that he spelled his word correctly. AP reporter Joseph White writes that as of this afternoon 33 spellers advanced to the bee's sixth round.